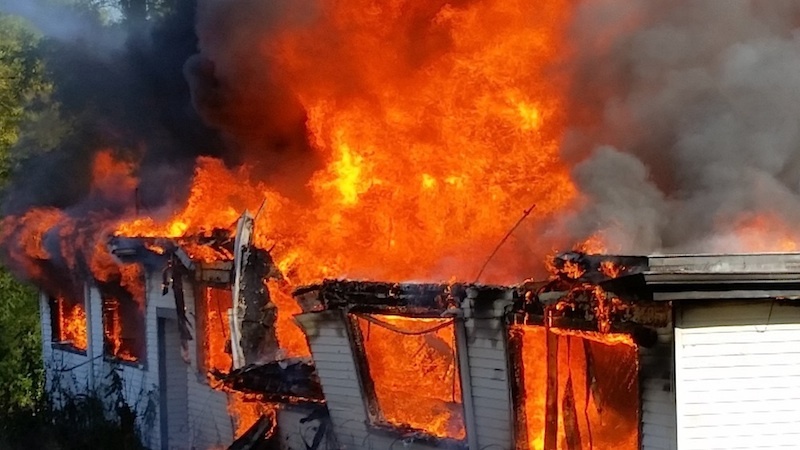 The Cary Fire Protection District, at long last, disposed of what remained of the River Bend restaurant – an abandoned, critter-infested shell – during a fire training exercise on Oct. 23. Still, Capt. Dennis Krenz had one more surprise for former owners Alberta and George England, who had come to say goodbye: A couple plates and some stemware for old-time’s sake. “The bar was still here, and wine glasses were still hanging,” Krenz said. As a kid, my family had many meals at the River Bend – a throwback supper club at 6614 Rawson Bridge Road in Cary. Back in the ’60s, it quite literally was out in the sticks – next door to the Northwood Fur Farm in a region dominated by farms rather than fairways. Sometime between 1935 and 1938, Chicagoans Erwin and Sue “Babe” Moews built a summer cottage on Tuxedo Lane. The restaurant building itself likely was there in some fashion – a refuge for thirsty patrons from the rigors of Prohibition. 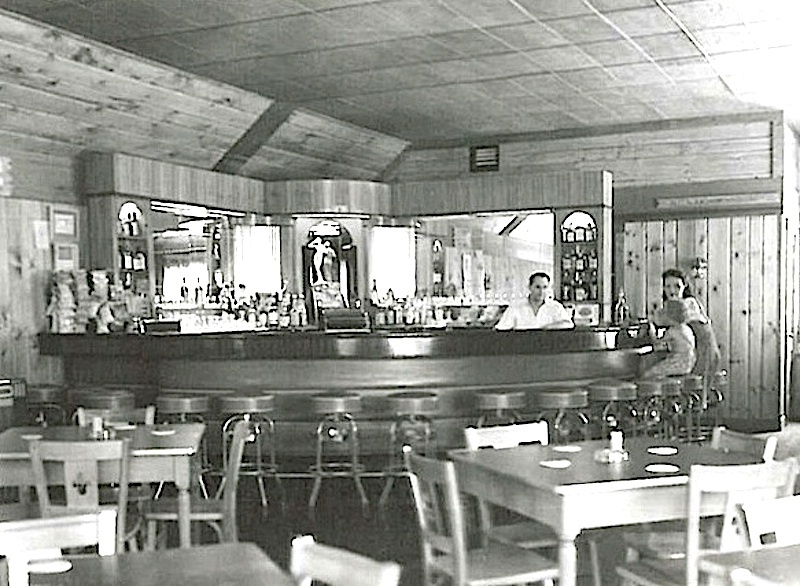 Irv’s Tavern was known for serving rye cold in the 1940s, but the establishment had a far more complicated reputation before that. Stories passed down through the decades tell of slot machines in the dining room and even the restrooms, Alberta England said. Gangsters also are said to have frequented the joint. But clearly local celebrities such as John Hertz; John Sexton, founder of Sexton Foods; and John Plain, of John Plain & Co. catalog renown, visited the restaurant on weekends. The Moews began adding food in the ’40s, but the menu did not really blossom until the next-door neighbors, Art and Lena Giovanoni, bought the place in 1948. 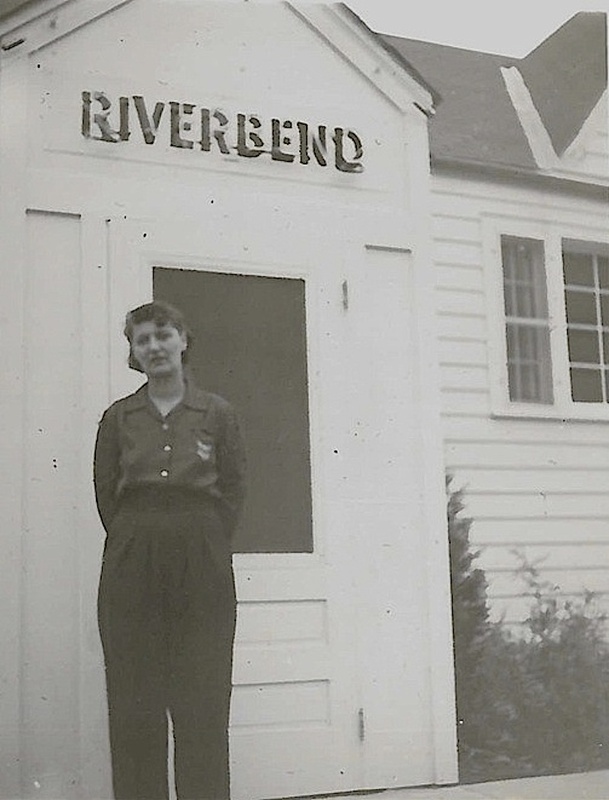 England said the River Bend was the first restaurant in McHenry County to serve pizza. 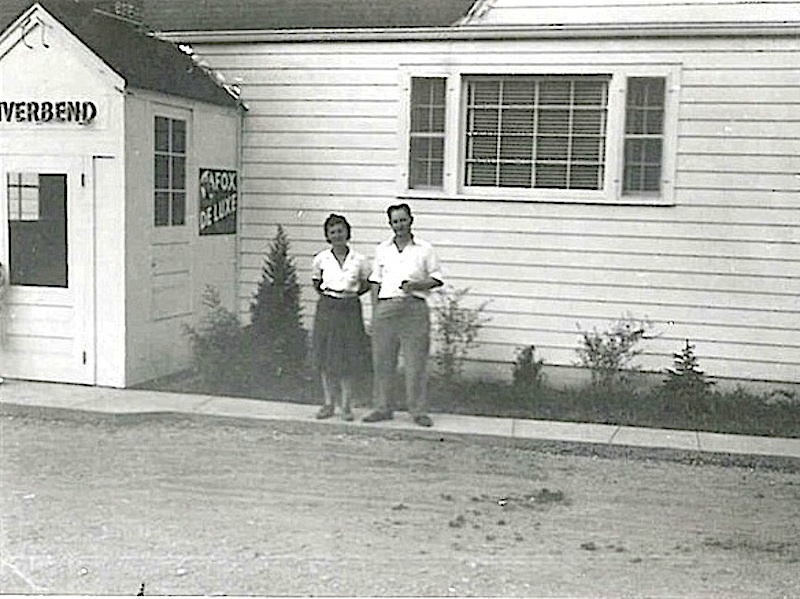 Dorothy and Marvin Krump bought the restaurant in 1955 and began expanding the bar and the menu. The River Bend became known for its steaks and fancy drinks. They had fashion shows featuring mink coats from the nearby fur farm. The Krumps owned and operated the River Bend until 1973, at which time high roller and golf course owner Herman Schwinge purportedly bought the place for his Las Vegas showgirl “girlfriend.” Legend has it that after three years, a quarrel ended their involvement. “Everything was left exactly as it was that very night, with all the food on the tables and in the coolers,” England said. That is exactly how Tom Decker and his son, Dan, found it when they bought River Bend seven years later. Dan Decker is credited with bringing a soup and salad bar concept to the restaurant. Alberta earned a bachelor’s degree in food science with a business concentration at the University of Illinois in Champaign. But her passion for food and cooking began years earlier in 4-H.
Alberta had grown up nearby, on a farm off Three Oaks Road. After graduating from Cary-Grove High School in 1962 and then college, Alberta went on to do food-related demonstrations for People’s Gas, Light & Coke Co. in Chicago. She also worked as a food section editor for the Chicago Today newspaper and became banquet manager at the former Hob Nob restaurant in Crystal Lake. One could argue that buying the River Bend was part of a natural progression. She and her husband, a salesman who worked evenings and weekends at the restaurant, sold the restaurant in March 2005 to Bob Gwinn of the Cary Public House. But before that, they set about putting their own unique stamp on the place. Menu favorites included a seafood buffet, potato pancakes, huge relish trays and specialty drinks and dishes – typically linked to a particular holiday such as St. Patrick’s Day or Easter. Alberta said it was not unusual to have 400 customers for a Sunday brunch. Saturdays were devoted to prime rib, and the weekly fish fry was a family staple. “On Friday nights, you couldn’t get in the place,” she said. The River Bend could seat 144 at one time. Unlike many restaurants, January through March was their busiest time. Many clubs would meet there, including the “The Shoresmen” (from Lake Barrington Shores) and snowmobilers. People came for music – which included a polka group Tuesday nights, accordion players Wednesdays, a variety of bands Friday and Saturday nights, and Dixieland jazz on Sundays. Visitors stayed for the food, the atmosphere and the circuses. “The things that happened at that restaurant, you couldn’t make these things up,” Galie said with a laugh. They ranged from older couples swapping spit to one group of “swingers” swapping partners. Even though the River Bend is gone, the stories remain – from the touching to the hilarious. Customers were keen to share the restaurant they frequented as kids with their own children. And the laughter? It seems to still echo from the dance floor to the kitchen’s back door. Many of the late-night antics, including a brief appearance by a horse at the bar and lingerie-adorned moose head above the fireplace to tease the conservative bar manager, were instigated by one or more of the restaurant’s 20 employees. “It was a lot of hard work, but I don’t think I’ve laughed as hard my whole life,” Galie said. Years later, they still consider the people they worked with family, said Galie, of McHenry. She and the Englands go on trips. Old employees share holiday meals. And they swap stories about a special place at a special time in the county’s history.